We love having overnight guests in our home. It always thrills my heart to welcome someone through our door. Every detail that I think will make the guests, and I try to do. I noticed time after time; I would show our overnight guests where things were in the kitchen thinking they would feel comfortable. Comfortable enough that from that point on to help themselves. This included where we keep snacks, but they would not ever feel comfortable enough to open the door. Once I realized what was happening, I changed my approach. 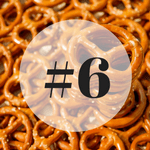 Here are six snack ideas to welcome your overnight guest, so they feel comfortable. Create a space in the guest bedroom for a basket of snacks. Don’t overdo it with the number of snacks, but have a few snacks for them to have throughout their stay. In the basket place a card welcoming your guest. This will make it personal, and the guests will know they were thought about before they even arrived. In the basket, you can put individually packaged snacks. Some of my favorite items to have a guest basket is pretzels, popcorn, chewing gum, Hershey bars, bottled waters, Cheese crackers, Skittles & mints. Make the snacks visible in the kitchen. 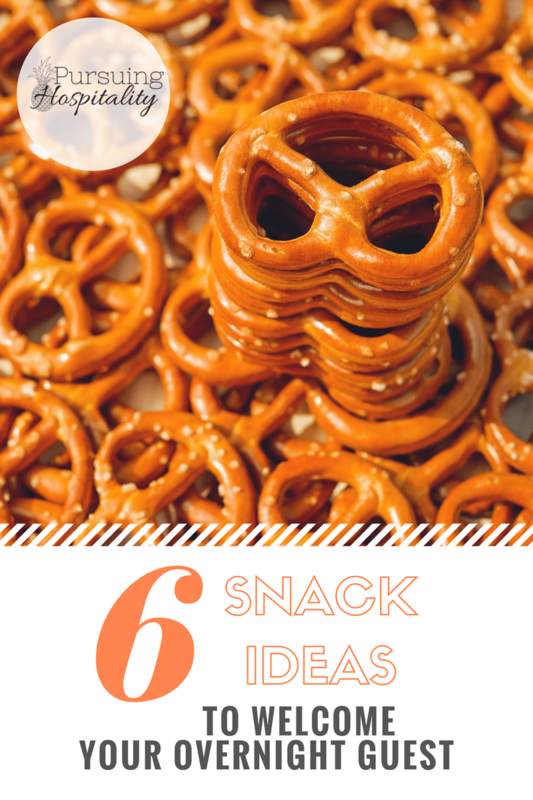 Place the snacks in a place in the kitchen that is visible to your guests. 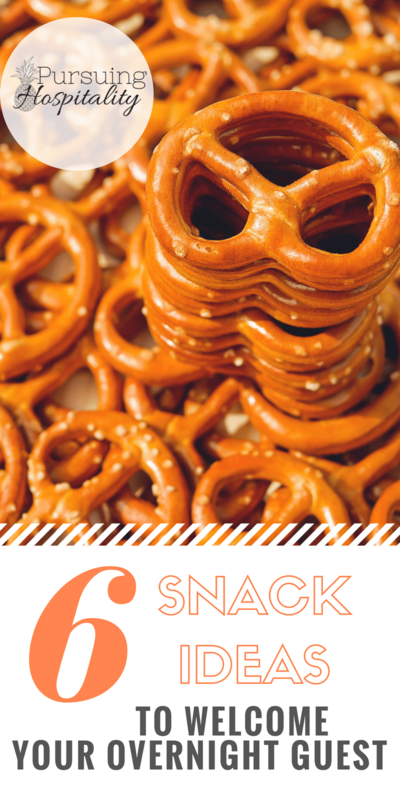 Just like the concept of Snack Idea #1, place a basket on the counter, the coffee bar or the kitchen table that is filled with a variety of snacks. You could even add fruit to the container. Making it visible makes it more inviting to your guests. You could do a cute tag on the basket that says, “Be our Guest.” That way it is evident that the snacks are for everyone. Place candy & nut dishes in the common areas of the home. You can have a candy dish in the living room that is full of M&M’s or hard candy. You can have a nut dish also in the common areas. You just need to be aware of any nut allergies that might be in your home. Pop a big batch of popcorn for everyone to snack on. Popcorn is like the universal snack that everyone loves. You can serve it the old fashion way with just good ole salt, or you can add some great goodies. Make the house smell like a bakery. I keep a box of brownie mix in the cabinet all the time. It is probably most liked dessert and also one of the easiest desserts to make. When your overnight guest arrives, they will smell the brownies, and it will welcome them into your kitchen and break the awkwardness of helping themselves in your kitchen. This one might be a little awkward, but ask your guest ahead of time what they like. Tell them you are heading to the grocery store to get some items before they arrive and you want to make sure you have things they will enjoy as well. If you get their input on what you have, they will know you have the items especially for them. When your guest arrives and gets settled, let them know where their particular snacks are and that you are so glad that you were able to have the snacks for them. When choosing snack ideas to welcome your overnight guest, try to have three options for my guest to choose from. A sweet snack, a salty snack and then just something easy to pick up and eat. The quick and easy snack is usually a pack of Fiber One Brownies, a fruit bar, or a granola bar. I look back, and I am so thankful I didn’t stop hosting after my first year of marriage. I failed so many times over and over through the years. But I learned from my mistakes, and hopefully, my guest in my home are getting the benefits of the desire to cultivate my heart of hospitality.